and watch yourself transform like water does. Please call 609-298-8585 ext. 212 to register. It’s never too early or too late to develop or sharpen your swim skills. We offer a wide range of aquatics programs and swim opportunities year round for children as young as three months old through adults. Our core purpose is to teach water safety, proper swimming technique and to foster a fun swim environment for recreational swimmers. Swim lessons are open to non-Members. All non-Members must call or stop by our club to register. Swimming is an essential skill that we all should learn at any age. We offer private and semi-private lessons in our pools for all ages. Our packages includes 8 (1/2 hour) classes. Spending time in the pool is the perfect way to stay fit while learning an essential skill and having fun. 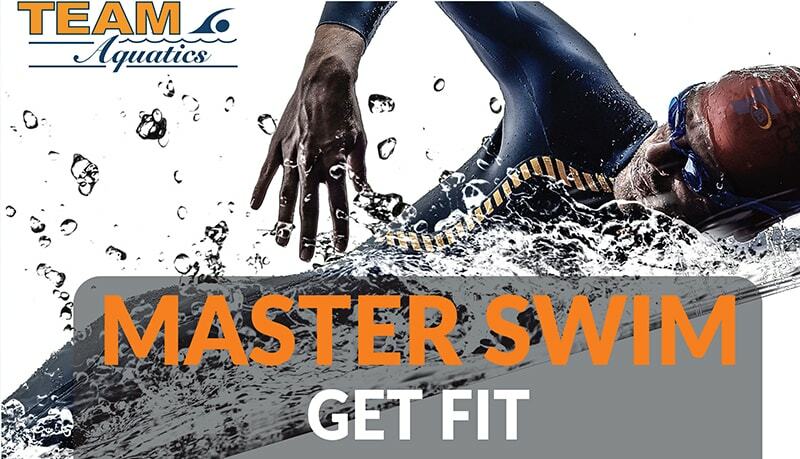 Join our master swim club for a high intensity aquatics workout and competitive swim opportunities. this program is perfect for anyone training for a triathlon or for anyone who just wants to workout in the water. You must be able to swim 12 laps to join. It’s never too late to develop or sharpen your skills. 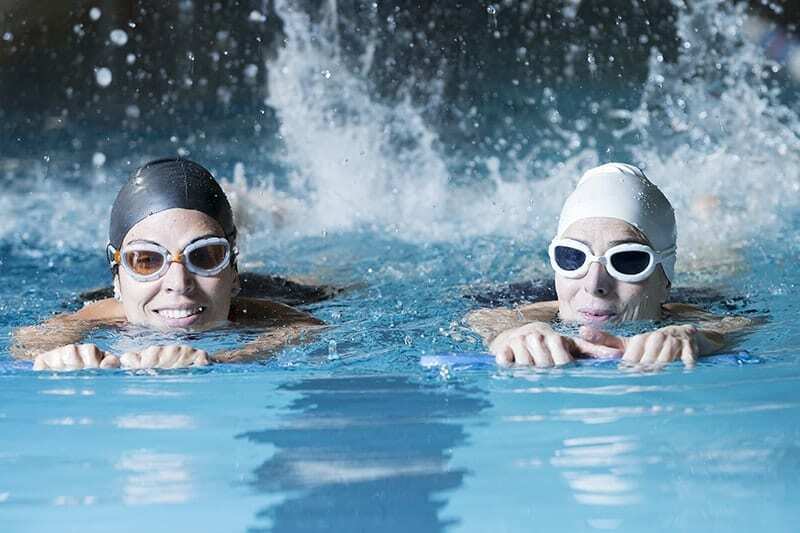 Swimming is the perfect way to stay fit while learning an essential skill and having fun. 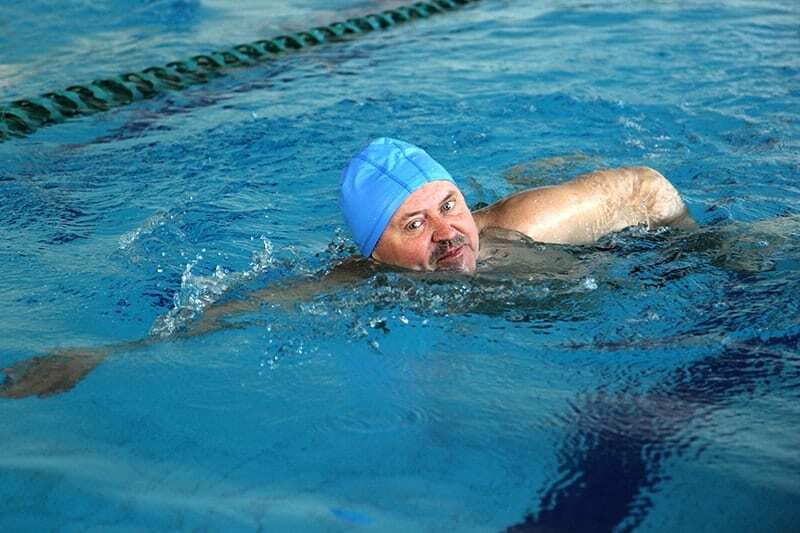 Adult group swim lessons are perfect for individuals that want tackle this new skill with the support of a group. A triathlon is a multiple stage competition involving three endurance discipline – swimming, cycling, and running. We host multiple Triathlons at our pools throughout the year to engage our competitive athletes and members! Will you be our next Team85 Triathlon Champion? Register early for our upcoming meet. Get Fit like a Fish in our beautiful pools. 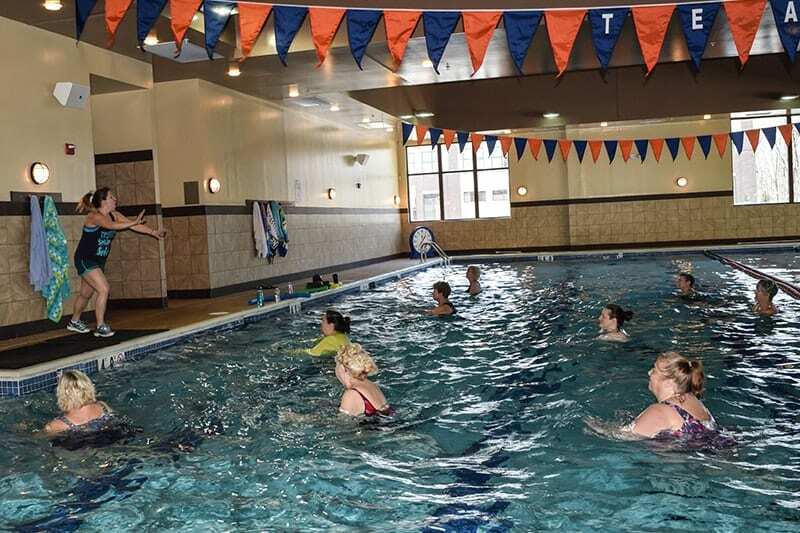 Water aerobics is a new wave sensational workout experience that’s gaining an increasing amount of popularity because of the dynamic results and pain relief. 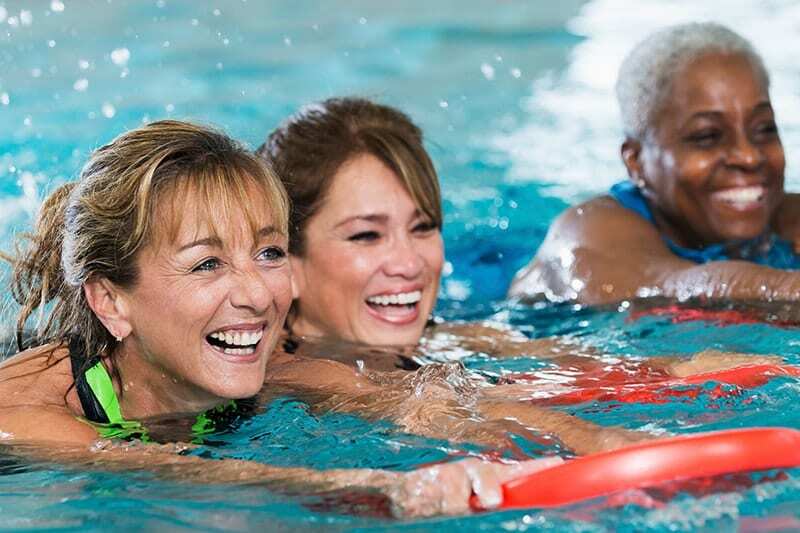 Water aerobics are known for having low impact on your joints and creating a natural resistance which means you are getting the ultimate safe and challenging workout. Begin your water aerobics experience with Aqua tone and Aqua Zumba. Aquatics Personal Trainers understand the dynamics and protection unique to water fitness and incorporate this knowledge into the program design. Aquatics personal training is perfect for individuals who are unconditioned, injured, experiencing health conditions such as arthritis, or who are simply seeking a nontraditional way to get fit! Contact Program Director to build the right program for you. Children 15 and under cannot be dropped in the pools and left to swim without adult supervision. Children that are not potty trained must wear a swim diaper while in the pools. All swimmers must rinse off prior to entering the pools. Swim Suits must be worn by all. No gym shorts or cut offs will be allowed in the pools. Swimmies are not permitted in the pools. No food or glass permitted in pool area. Long hair must be pulled up or in a swim cap while swimming in the pools. Laps lanes are designated for lap swimmers only. If lanes are full, swimmers must share with other swimmers. Children are not allowed in lap lanes for free play. Walking will not be allowed in lap lanes unless they are not being utilized for laps by other members. No jumping is allowed in the splash pool. Pools will close when there is lighting and thunderstorms in the area. Failure to comply with these rules and all other rules posted in pool area shall be considered sufficient cause for suspension of pool privileges by the management of Team85 Fitness and Wellness.